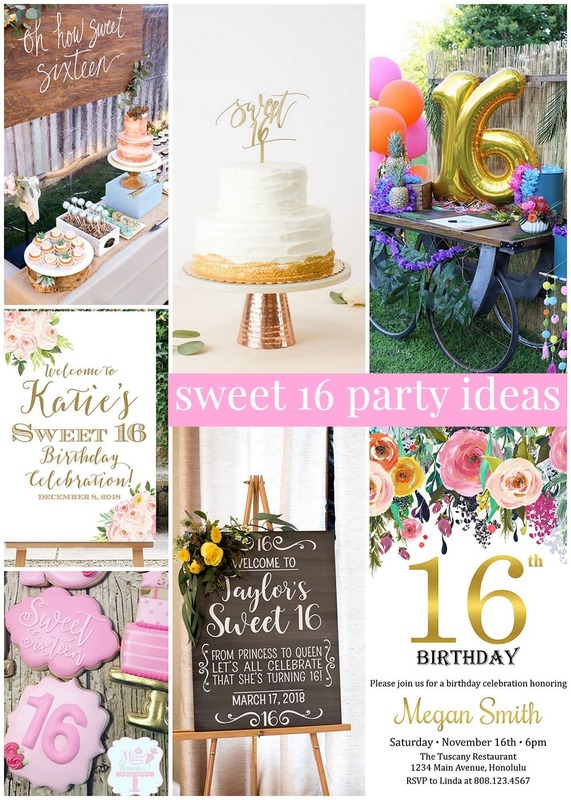 Sweet 16 Party Ideas | Decorations, Themes, & Lots More! 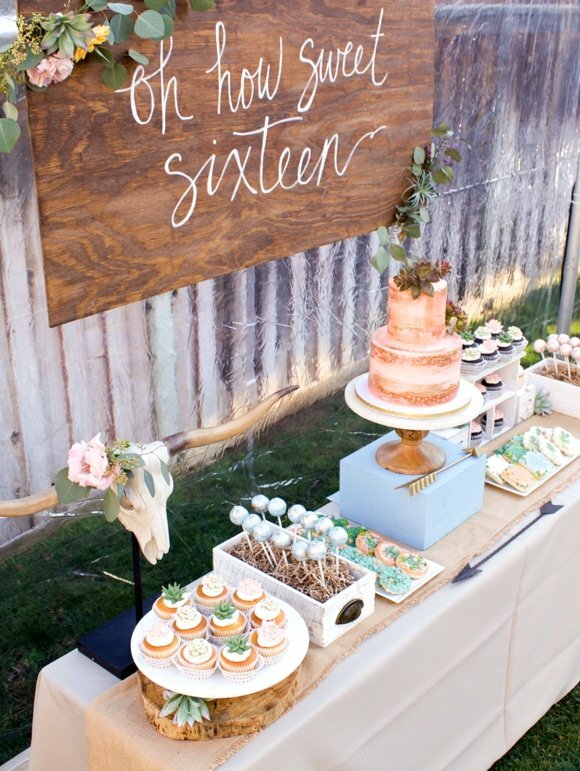 Tons of Sweet 16 Party Ideas from themes to decorations! It’s been awhile since I shared themed party ideas, so alas, it’s all about Sweet 16 Party Ideas today! I discovered my love for parties from my own Mom (who now works with me full-time at Pizzazzerie), and she hosted quite the epic Sweet 16 Party for me when I was growing up. It was complete with a gorgeous pink dinner party complete with a little silver bell for me to shake whenever my friends or I needed anything. I was on cloud 9! 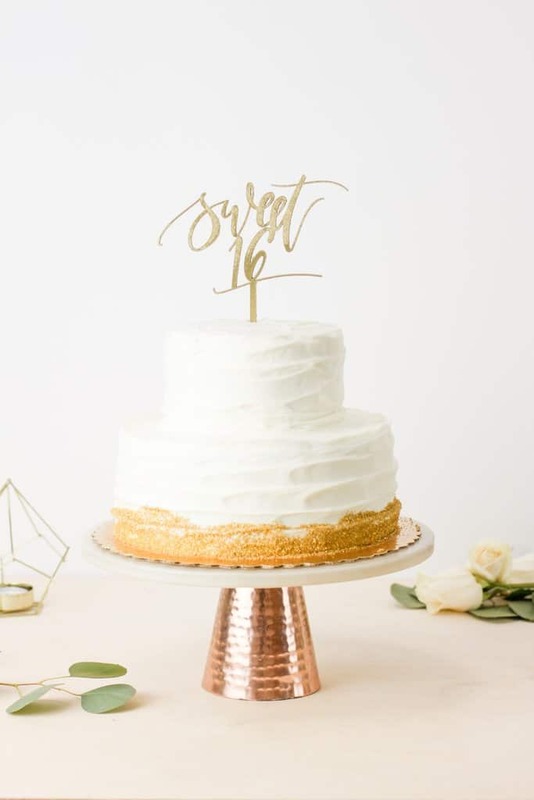 I know how much fun it is to have a fabulous Sweet 16 Party, so I wanted to share some “sweet” ideas if you’re hosting one soon. 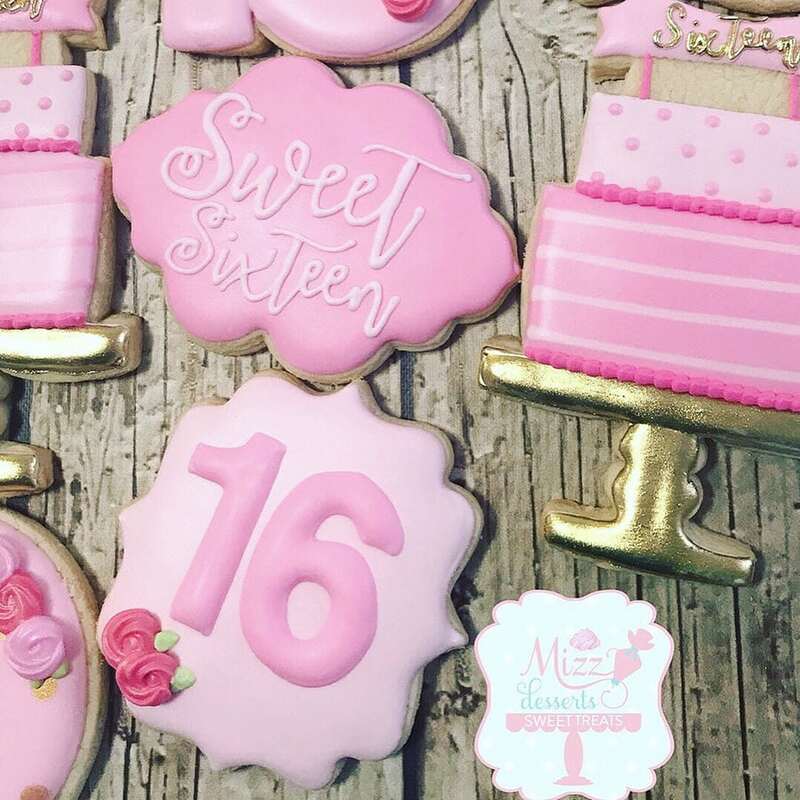 Hopefully you’ll find LOTS of Sweet 16 Birthday Party inspiration! Let’s start off with one of my favorite party elements, cute signage! I love this yellow Sweet 16 Party featured on Catch My Party from Xpression’s Floral & Event Design. 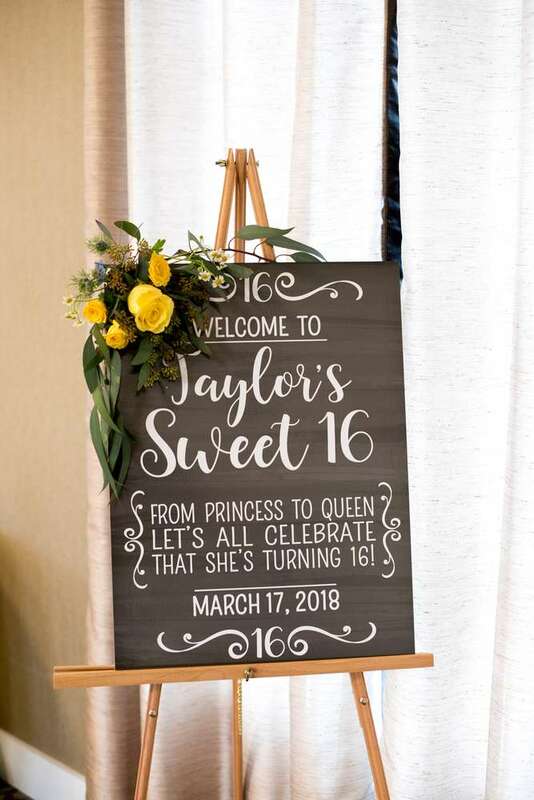 Chalkboard signs are a GREAT way to display Happy Birthday for the birthday girl along with a cute rhyme or saying! They also make a great photo booth prop. 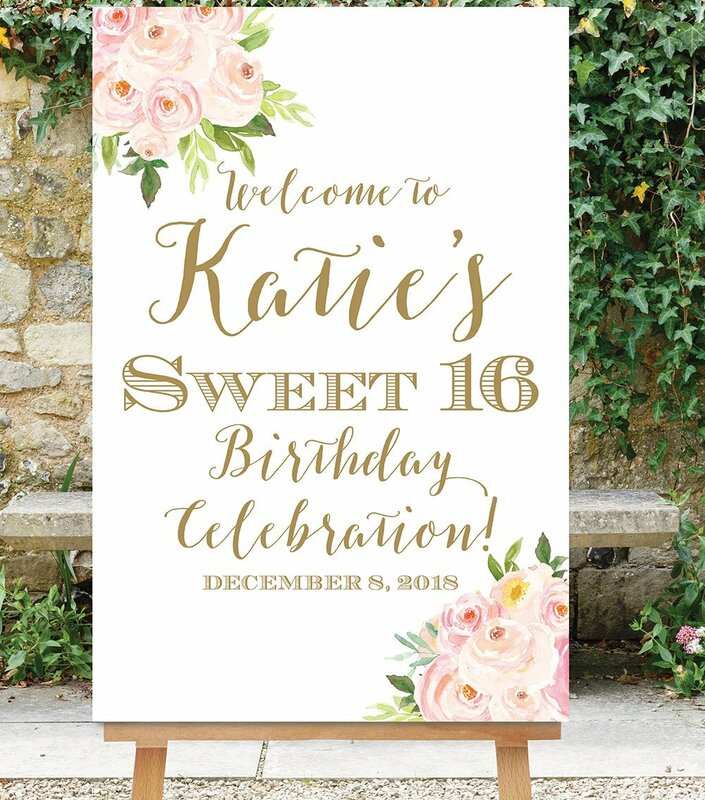 Here is a printable Sweet 16 Birthday Party Sign from SimplyFetchingPaper on Etsy! I love that you can download the digital printable and have it printed yourself. You could create the entire party theme around this sign above by sticking to peachy pink flowers, desserts, and decor! Think outside the box with the theme! 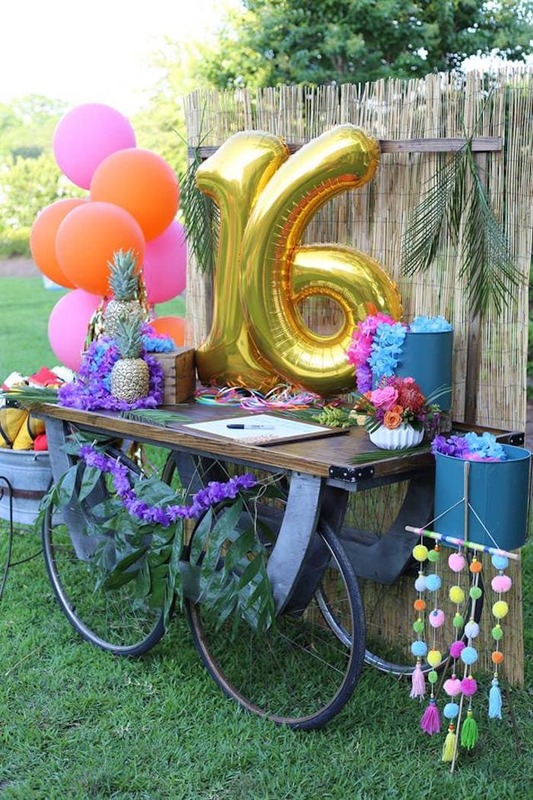 While I love a good “sweet” candy-themed Sweet 16, I love the Boho Themed Party that my friend Tori styled for her daughter when she turned 16. It is stunning! The classic “sweet” theme (candy/desserts) – Set up sweet treats with bags for all the guests to create their own favorite treat mix! Boho Theme (see above photo) – I adore this modern theme! Parisian/Night in Paris Themed Sweet 16 – Go with a pink/black/white color scheme, all things Parisian! Serve up macarons and eclairs. Fashionista Sweet 16 – Let the girls decorate their own tank tops, host a “fashion show”, make a dress or shoe cake! Beach/Pool Themed Sweet 16 – This is perfect for summer birthdays, big pink beach balls, cute personalized drink cups etc. Tiffany & Co Blue Themed Sweet 16 – Use the “Tiffany” blue along with black and white, watch old classic movies, etc. Under the Stars Sweet 16 – set up a camping theme party with s’mores, movie projector, etc. Black & White Glam Sweet 16 – Keep it all black and white, fill the room with black and white balloons, serve up sweet treats, etc. You can keep the cake simple by adding a gorgeous topper like this one from Letters To You! Make your own or ask your grocery store for a simple white buttercream cake. Then adorn it with a topper like this one or fresh blooms. I have a similar cake idea in my book that’s perfect for milestone birthdays! 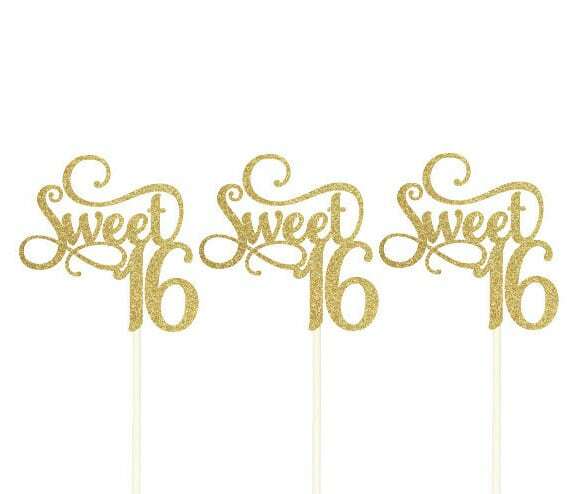 I love these Sweet 16 cupcake toppers, which is a miniature version of a larger cake topper. These are perfect for adding on top of simple cupcakes, party food, appetizers, etc. Find them here on Etsy! 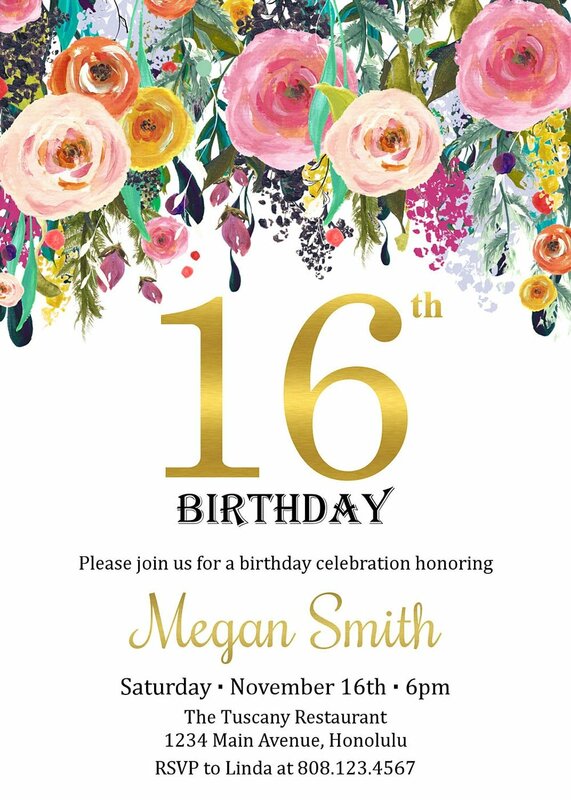 If you’re looking for an invitation, definitely check out this cute Sweet 16 Invite! If you want to keep budgets in mind, then you can always opt for a digital invitation. For a colorful theme that’s perfect for summer birthdays, I love this Sweet 16 Luau themed party! The gold mylar balloons are perfect (head to the party store, you can usually find them in silver, gold, and magenta). 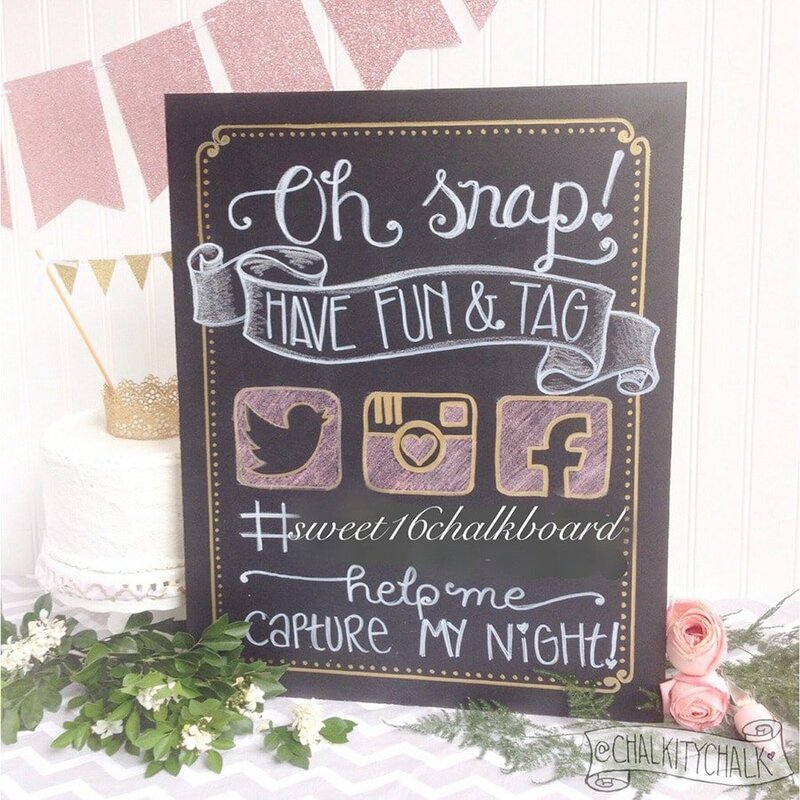 Sixteen year olds LOVE to capture photos and memories, so I love this hand-lettered chalkboard idea to create a hashtag for the party so friends can all share their photos and videos of the Sweet 16 party! Then, the birthday girl could print the photos and create a keepsake book of her milestone birthday. Balloons! Large mylar 16 balloons are a must-have for the special occasion! Making DIY Tassel Garlands are one of my favorite ways to add festive flair whether you’re having the party at a venue or at home! Favors! Even if it’s something as simple as an iced sugar cookie (find the ones shown above here), set up a little favor table with extra balloons and decorations. All the guests will feel special grabbing a treat as they leave. Coordinate the icing colors to your party colors.